Summer is definitely here, it’s time to bring out the salads and to eat al fresco. 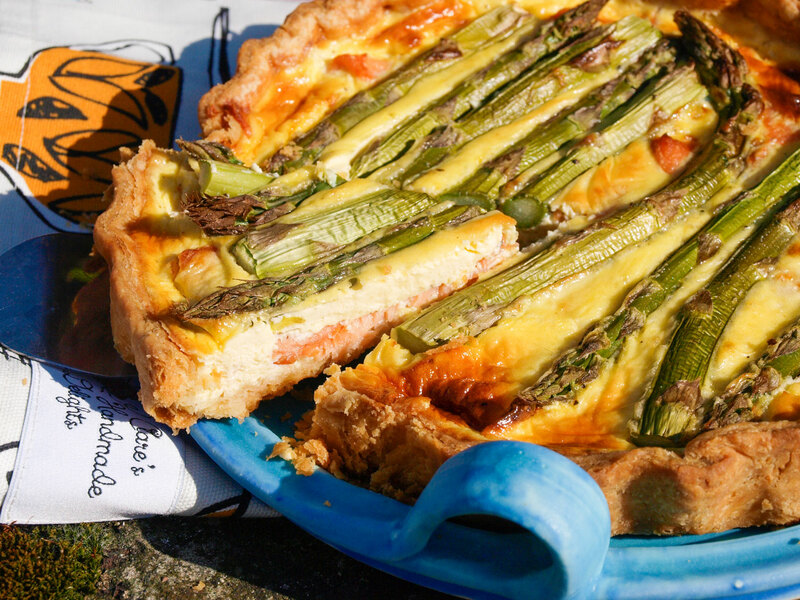 This Smoked Salmon and Asparagus Tart is a delicious combination of smoked salmon, soured cream egg custard, and fresh asparagus spears. 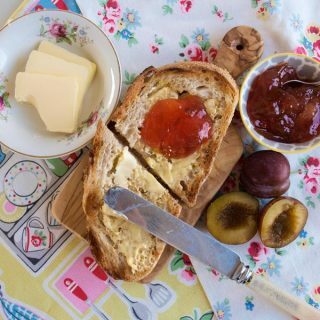 It’s an ideal recipe for summer lunches and picnics and would easily grace a summer buffet at a wedding or other occasion, and it’s a fairly straightforward to make. , I made shortcrust pastry and baked it blind, but you could buy the pastry or even a ready made pastry case if you are not confident about pastry making or simply don’t have the time. 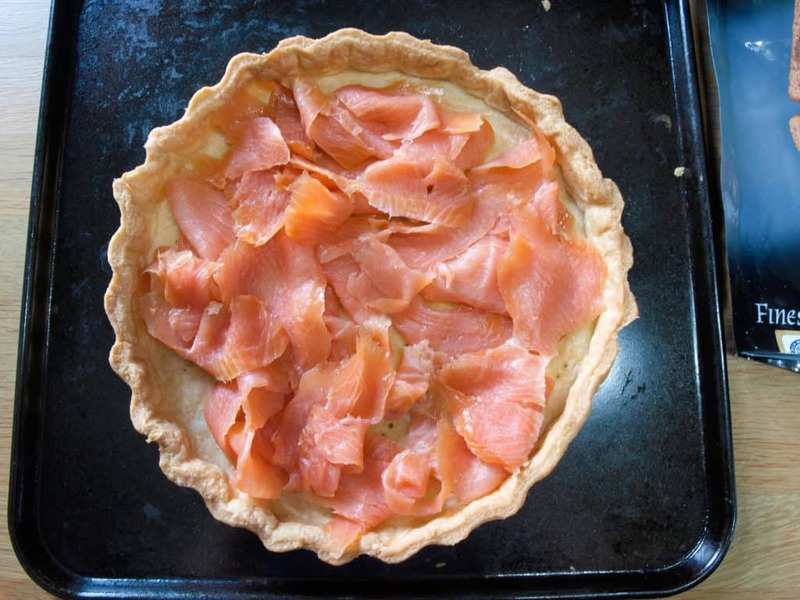 My preference would always be for Scottish smoked salmon, of course, but really any good quality smoked salmon with give that delicious smoky, salty taste that makes this tart so moreish. Asparagus spears seem to be less expensive this year, supermarkets are stacking them high and selling them cheap, I just hope that doesn’t mean the farmers are struggling to make their profit margins and also that it doesn’t affect the quality. These spears certainly seemed very fresh and the woody bottom of the stem broke off with a satisfactory snap! 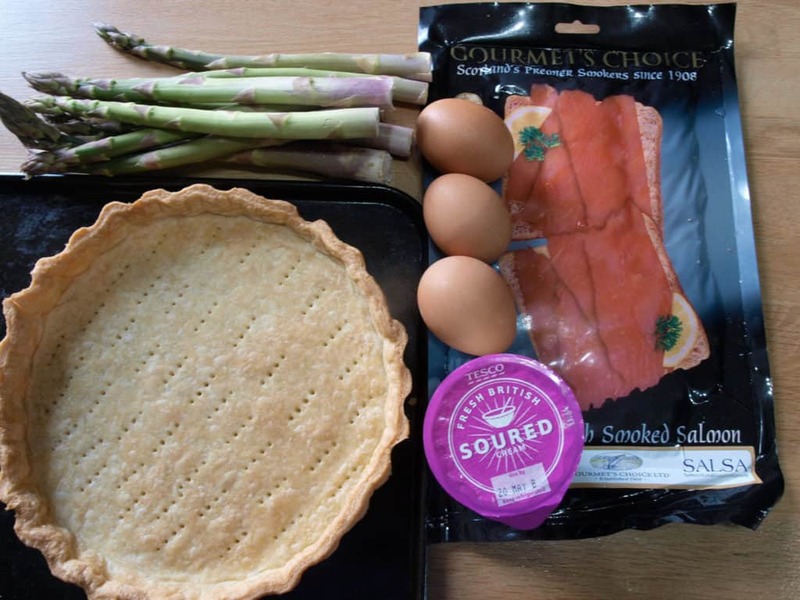 I used soured cream and a little milk with the eggs to make the custard that brings all these ingredients together into a tasty Smoked Salmon and Asparagus Tart. 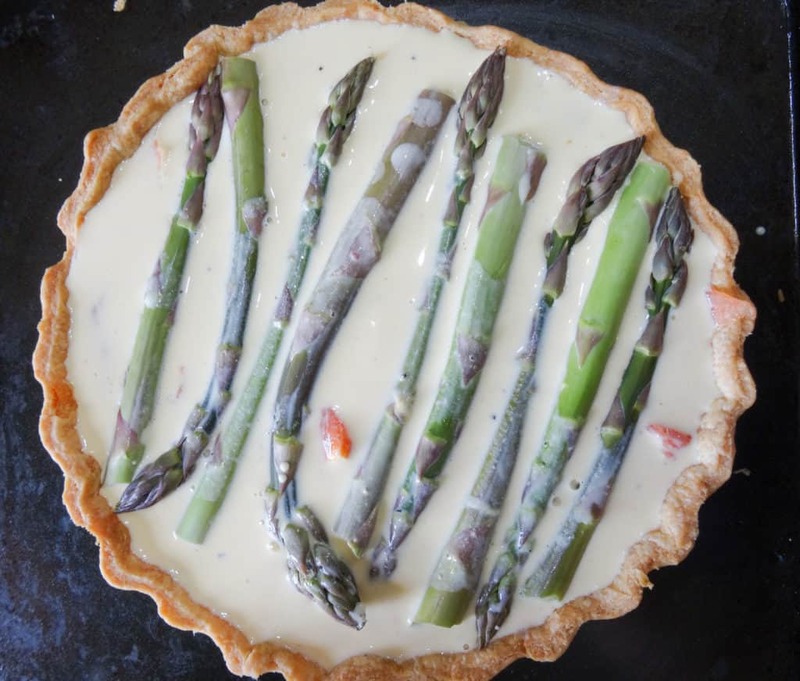 A crisp pastry shell filled with smoked salmon, a soured cream custard and fresh green asparagus, ideal for summer eating. Rub the fats into the flour with your fingertips until they resemble breadcrumbs, or whizz it up in your food processor. Add the salt and the beaten egg and mix to a dough, adding a little cold water if necessary. Try not to handle the dough too much as this makes it tough. Wrap the pastry in clingfilm and refrigerate for 20-30 minutes. Roll out on a lightly floured work surface and use to line a 28 cm/11 inch loose-bottomed flan tin. Cover the pastry with greaseproof paper or foil and fill with baking beans or any raw dried beans. Bake in a pre-heated oven at 180C/350F/gas mark 4 for 20 minutes. Remove the beans and paper and return the pastry case to the oven for 5-10 minutes until lightly coloured. Lay the smoked salmon in the base of the pastry case. 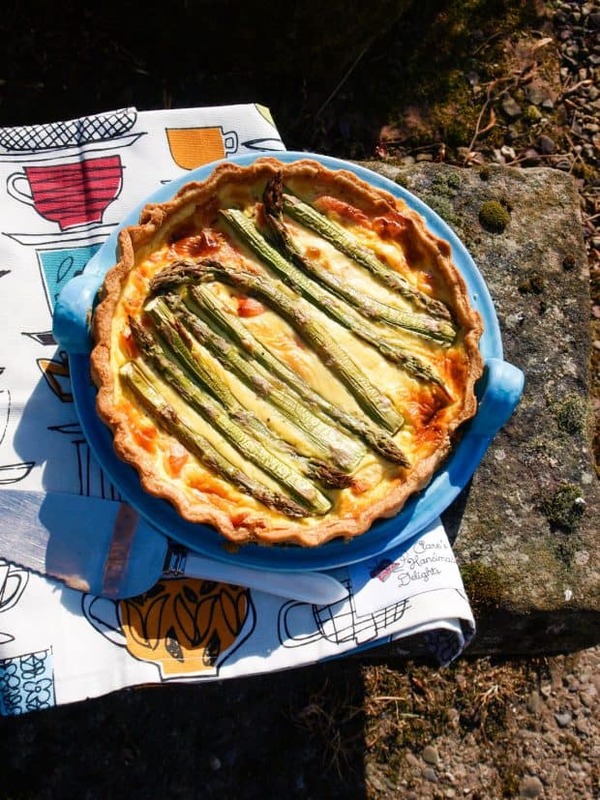 Snap off the woody ends of the asparagus, simply bend the spear and it will snap off at the right place, lay the asparagus spears across the tart, alternating the direction of the heads. Beat the whole egg and egg yolks and add the soured cream and milk and blend together, add a few grinds of black pepper, no salt is required as the smoked salmon is quite salty. Place the flan tin onto a baking tray and gently pour the egg and cream mixture into the flan. 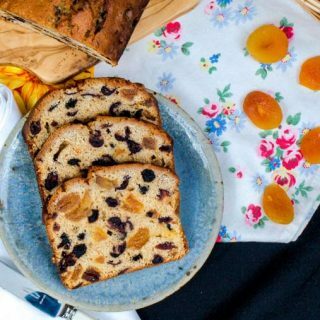 Serve with salad or new potatoes and roasted cherry tomatoes. 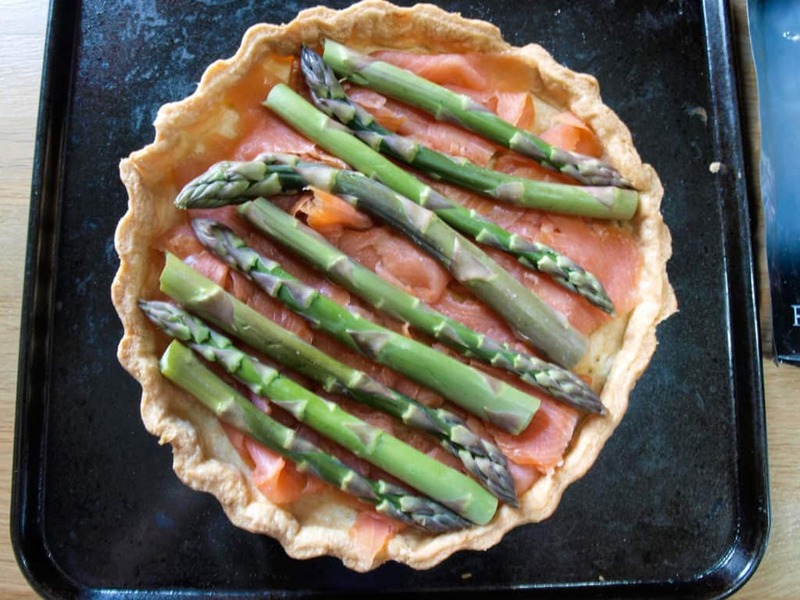 If you would like to be kept up to date with recipes like this Smoked Salmon and Asparagus Tart then please subscribe (add your email to the box on the right) to receive updates straight to your email inbox. Ooh I love the look of this, two favourite ingredients in a quiche, another favourite! Yes please! Thanks, Kavey, they are certainly some of my favorites too. 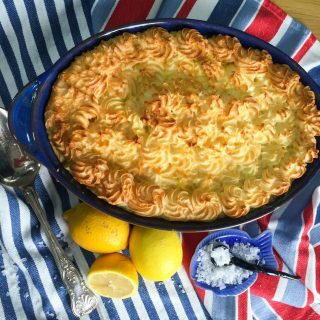 Looks delicious, will be having a go! Thanks Rachel, I’m sure you’ll love it as much as we did. Smoked salmon and asparagus is such a delicious combo, and we often have it for breakfast. But I love the look of this tart. Thanks Dannii, I guess you could eat this Tart for breakfast too! I’ve had quiche for breakfast in the USA, it makes sense when you think about it. Ah Janice you’ve captured all my favourite flavours right there! There does seem to be a lot of really chunky Asparagus around at the moment a wee bit piled high and sold cheap. I’ve managed to get local Scottish but at close to £5 a bundle. Aw thanks, Jan. 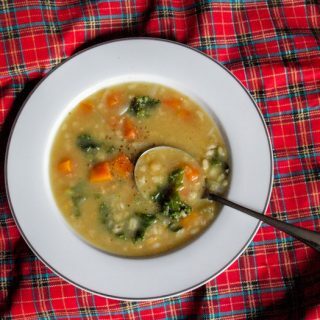 It was really good, but with those ingredients, you can’t really go wrong! Can’t go wrong with smoked salmon and asparagus. Oh, you have me drooling for a tart now! Thanks Michelle, glad you liked it. Oh lucky you living close to an asparagus farm. Better be quick, the season is nearly over! This. Sounds. Simply. Amazing. I need to make this asap! Thanks Emma, it’s a simple thing, but those ingredients make it special.